Cape style home with lots of room for your Family and Friends. 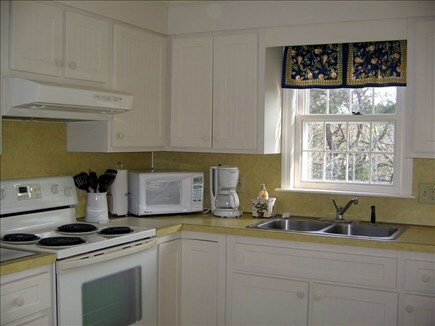 Efficient & well appointed kitchen & layout makes meals a breeze. 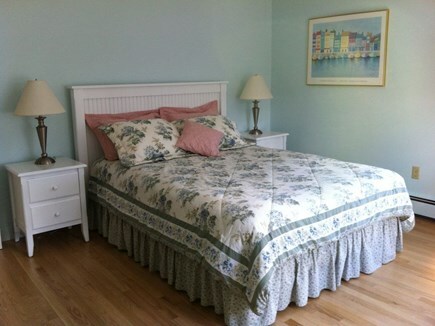 Newer Master Bedroom, Queen (new), White bead board furniture. Queen Bed room, spacious and bright. Grilling on the Deck - Perfect at the end of a great beach day. 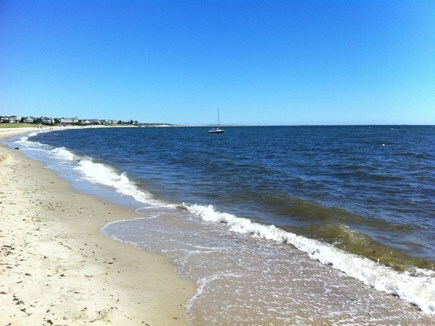 Walking distance, 8/10th mile, to Cockle Cove Beach. 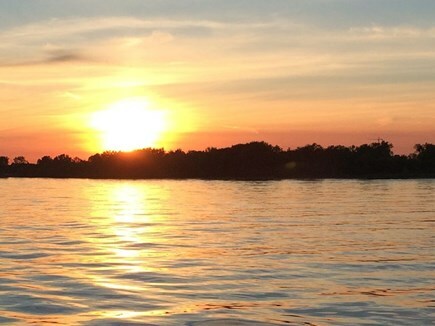 Sunset on a wonderful day. 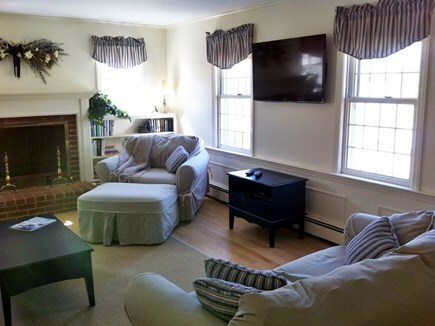 This sunny, bright, breezy and exceptionally clean, comfortable and relaxing Cape style home, south of Rt. 28, is 8/10 mile from Cockle Cove Beach on the Ocean. 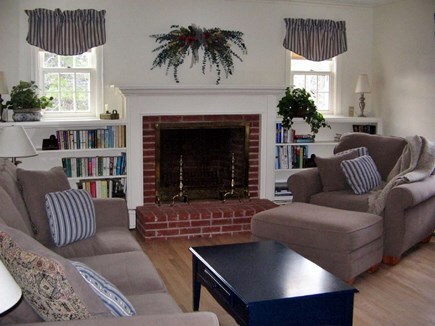 Located on a quiet cul-de-sac, this home has been renovated in Cape Cod tones and includes comfortable, updated furniture. The living room has a newer, large, flat screen HDTV and the fully equipped eat-in kitchen includes a dishwasher. Recently renovated bath with tub/shower on main floor. Enjoy WIRELESS INTERNET throughout the home and deck, as well as cable TV, washer/dryer, and a newer Webber gas grill. The private outdoor shower with hot/cold water, and bench, is perfect for after beach clean up. Gleaming oak hardwood floors in all main floor bedrooms and livingroom and a ''No Pets'' policy, make this home a ''Low Allergen'' enviornment. 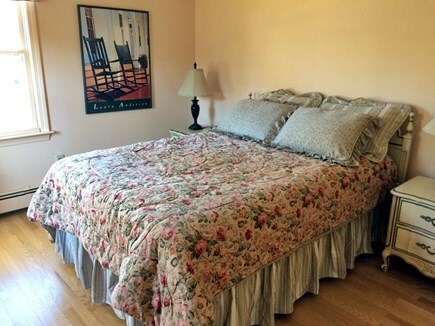 Master bedroom (with Firm Simmons Beautyrest mattress) has newer Boston Interiors white beadboard furniture. Mattresses on double and twin beds are firm and comfortable. PLEASE BRING YOUR OWN SHEETS AND TOWELS. All bedrooms are large and comfortable and have AC units. Sea Breezes usually make AC unnecessary. The family room, on lower level, also has a large, flat screen HDTV, one bedroom with twin beds (4th bedroom) with AC unit, and a bathroom with shower. This is a great area for teens and for everyone watching Sports. Washer and dryer are on this level. 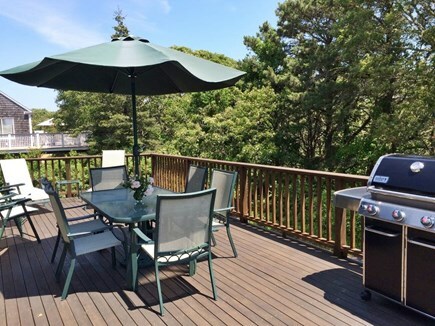 The large mahogany deck, faceing a peaceful nature conservation area, with deck furniture, table and chairs, canvas market umbrella and newer Weber gas grill, make outdoor dining relaxing and easy. Walk to The Old Schoolhouse Ice Cream shop for an after dinner cone, or bike to the bike path less than a mile away. Stop in to Marion's Pie Shop for homemade pastry on your short drive to downtown Chatham featuring many wonderful restaurants and shops. Both children and adults will love visiting the playgrounds and parks throughout town. Chatham A's baseball games in town are extremely popular. The whole family will enjoy seeing the working Fish Pier and watching fishermen unload their catch from the deck above the boats. It's fun to see the seals swimming near the boats. See current movies at the renovated Chatham Orpheum Cinema, and the Marconi Wireless Museum is fascinating for everyone. Come to Chatham to experience all it has to offer, explore and discover more on your own and make lasting summer memories. PayPal and Personal/Bank check accepted. Additional availability info: Cleaning Fee - $180 (additional) . Security Deposit - $250 (refundable after inspection of home). This is a Saturday to Saturday vacation rental. Additional pricing info: PayPal and Personal/Bank Check accepted. Cancellation Policy: Check with owner prior to booking. State and local taxes of 12.45% will apply. Main floor of house is 2 steps up from ground to deck and entrance to kitchen. 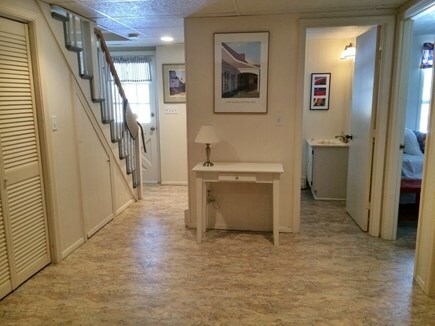 Main floor features 3 bedrooms and 2 baths. Master bath has 2 grab bars - one is outside the shower and one is inside shower stall. HOUSE WAS VERY CLEAN , sunny and nicely decorated for a vacation property. We loved our stay at this house. The owner, Barbara, is very pleasant and attentive to anything you would want to know before you arrive, and makes every effort to make you feel comfortable in her house. We will definitely come back next year for the same week. We would highly recommend this rental. This is the second time we have stayed in this home and we love it! It's in a great location near Cockle Cove and Ridgevale Beaches and a short drive to downtown Chatham. 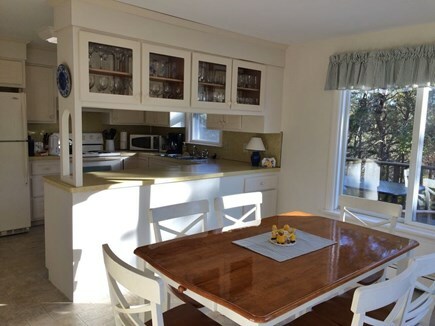 The house is very clean, tastefully and comfortably decorated, and had everything we needed for a fun vacation (beach chairs, umbrella, fully stocked kitchen etc.). 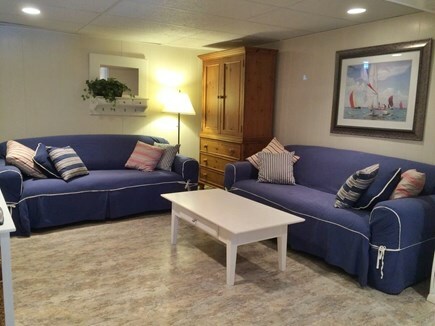 Our kids love having their own space in the finished basement with a bedroom, bathroom, and TV to themselves. />Barbara is very responsive and lovely to work with. 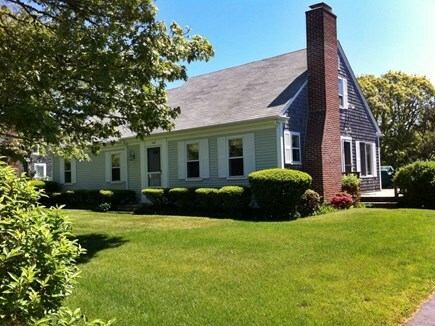 This Home is located close to Chatham Center. We had a wedding in Chatham and had easy access to all the events in town. The place is very nice and is reasonably priced. Everything about the stay was positive and the House had everything we needed. Barbara is a terrific host who cares about her customers. My family stayed here the first week of June. The owner was easy to get in touch with when we needed help with things in the house. It is a close drive to Chatham and all the sites. It is equipped better than any rental I've had....even great wine glasses! The exception is you'll have to rent your own linens...which I understand is common for a Cape Cod rental. This vacation house feels like home! We rented this home for a girls getaway week. As some of us have food sensitivities, we cooked there a lot. The kitchen pots and pans, utensils, etc.. were some of the best we have seen in a vacation rental. There was even a new gas grill for us to use, and we took advantage of it. Beds were comfortable and there were plenty for the five of us. The house is in a private, wooded area --very nice location. Barbara was super to work with! She answed our many questions, and went out of her way to get information on area attractions for us. She is a landlady like no other! The house and location were as described. The house was well equipped, clean, and had plenty of room for a large family. Especially enjoyed the deck and new grill. The basement had a bedroom, full bath, and a large room with big screen TV, which was perfect for the older kids to be on their own. Barb (owner) was exceptional with follow up communication to make our vacation even better. Especially liked the personal touch of fresh flowers in the kitchen. The owner and home were lovely. We vacationed here for a week of the 4th of July holiday and I can tell you it's the perfect location to take a nice walk to the quiet beach down the road (exactly a mile walk!) or a nice drive into town - passing ice cream shops, bakeries, adorable souvenir shops, and delicious restaurants! The Chatham A's play about 3 miles down the road and we were able to watch 2 games! The lighthouse beach yoga everyday at 7AM will get you up and ready for the day. This home and town were the perfect family place. We barbecued every night on the big back wrap around deck. The outdoor shower was perfect for after beach rinses. The big front yard was perfect for kids to play and such a quiet neighborhood made nights very peaceful. The owner was nothing but helpful and incredibly communicative about move-in ready updates and questions throughout our stay. The lower level allows a lot of privacy from the main floor which was helpful for our guests.